Ranked #21 in our countdown of the 100 Best Hotels and Resorts in the World. Want to be Maharaja (or Maharani) for a day… or week? 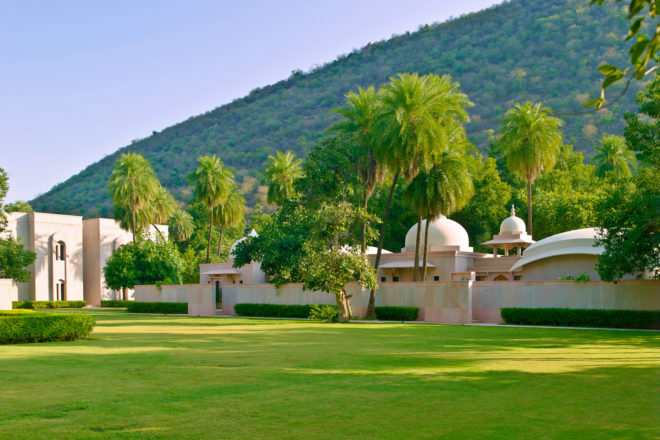 Anything seems possible at Amanbagh, hidden in a traditional walled compound at the foot of the ancient Aravalli Hills. An oasis of palms and eucalyptus, this sugary-hued palace echoes Rajasthan’s royal architecture but with characteristic Aman restraint. Expansive haveli suites and pool pavilions feature lagoon-deep Udaipur green marble baths, private terraces and cool courtyards. The dining hall is majestic, the swimming pool is royal in size and the staff, in jewel-like saris or magnificent turbans, are regal. Yoga, meditation and herbal therapies are available. Explore the area by camel, bike, cushion-laden Shikara boat or jeep. Did you know Amanbagh sits within an old walled compound once used by the Maharajah of Alwar as a base from which to hunt tigers.